Full Information on the Workshop — including the schedule and information on tickets can be found in the section under April 2019 Interactive Arts Workshop on the menu bar above. The Association for the Promotion of the Art of Horsemanship in America (APAHA) is dedicated to supporting educational opportunities that advance horsemanship as an art form in America. By providing opportunities for professional riding teachers and trainers to learn on trained horses, APAHA is working to ensure that horsemanship as an art form is preserved for future generations. The article below helps to explain the mission of APAHA. There are three notions behind APAHA, each of which evolved from three distinct points in my life as a rider. The first is the notion of refining an idea on a trained horse. In the initial years of my riding career, it was on my mother’s trained horses that I was given the opportunity to feel on horseback. After my mother’s death, my teacher, Nuno Oliveira, continued to provide me with the opportunity to perfect my feeling on horseback by letting me ride his personal horses, which had the benefit to him of giving his back a break. This was also the start of a different relationship between us. Oliveira became not just my teacher but also a benevolent and amused mentor who nurtured my development as a rider. I finally got to ask questions on the right way, meaning questions related to understanding about being in the moment and at the right juncture of learning – that is, I could learn as my body imprinted reflexes and absorbed the significance and impact from the horse’s perspective. This type of biofeedback from the horse, followed by explanations of how deep to go physically and psychologically trains you to keep the focus to and for the horse. Providing an aid through a trained horse gives all sorts of opportunities for guided dialogue. And equally important, you have the comfort of knowing that you do not have the task of training the horse, you are merely to experience his knowledge and feel your way through mistakes instead of around them. Mistakes are part of learning, but you must be able to make them and be corrected in a safe way. Under Oliveira’s guidance I was allowed to make the mistakes I needed in order to learn but always under the watchful eye of my mentor. This experience in my riding career made me see the value in having access to trained horses that can be teachers but with the learning guided by an experienced mentor. The second notion behind the idea of APAHA is to collect, preserve and teach from a body of experience that can provide in a Socratic and responsorial fashion the answers riders should seek once they have managed to link feel to technical components. Discovering these answers takes time, which is why in the APAHA program this is seen as a two-year progression. The idea of this educational phase is for young trainers to participate in APAHA educational experiences four times a year for one to two weeks. Participants in this APAHA educational program can also opt to take classes at nearby APAHA sponsored clinics. These two years of study are linked to what I learned in my time with Master Oliveira – the value of learning under an experienced eye. This is a time that also allows you to feel your way around mistakes that are about to happen because of lack of experience and mileage, but it all occurs under a watchful eye that will temper your ideas and can pull you back from the abyss of crassness in time to save the horse from suffering the fallout of your learning. Oliveira’s generation called it godparenting the young trainer. In loco parentis the master awaits the apprentice trainer’s budding ideas and does not blunt them too far but judiciously prunes them. And then, the master answers the design questions of this garden being planted by the apprentice but allows the design to be a personal creation. What is described here is a state beyond what many consider teaching and it is a state that is very hard to explore if you are trained very young. It requires not only that you stay capable in your own riding of reexamining your effects but also that you put yourself in a state of causality. You must also learn when to let the major blunders happen. I wrestle with this in every coaching session. But doing so makes me get back in touch with the equine’s moments of complete rejection of the human endeavor. It is a symbiotic relationship between master and apprentice. The young trainer receives grounding, a compass and also understanding of the horse’s balanced efforts in the transition that is hardest to make – that of becoming flexible enough to attempt sustaining an idea of self-carriage and impulsion. The older trainer gains rejuvenation of perspectives and awareness of the steps trod so long ago in the training sequences. And, the older horses re-knit the threads that habit had frayed and refreshes his amusement at the human endeavor. The third notion behind the APAHA concept is that of learning to teach on the personalized learning curve you are going through. It is very difficult to learn technique in a way that imparts its impact to all horses in all forms of training. It requires that the trainer be a communicator amused by frustration. It also implies that while you are struggling to learn yourself, you are just as keen to help others learn at their level. A part of this also relates to being a listener of horses. That is, being one with the ability to hone in on blockages and chip away to find both the physical and psychological sources. The APAHA program is particularly open to professional clinicians who operate throughout the U.S. at very basic levels. It allows them a respite to work on their own riding, to bounce off an experienced mentor their own ideas on technique and the questions and thoughts in their minds. For such teachers, APAHA seeks to provide them with a truly unique educational opportunity by linking them with breeders who support the APAHA mission. The breeders’ co-op loans out young horses so that APAHA students are provided with an opportunity to do guided break-ins. In payment for this educational opportunity, teachers in the APAHA program commit their time to participating in APAHA workshops to educate other teachers. In essence, teachers who become students in APAHA programs also then become teachers to other teachers who participate as auditors. The workshops also feature teachers from differing backgrounds who are there to give APAHA riders exposure to other perspectives and ideas on riding and horsemanship. It broadens the education of APAHA riders even as they work to focus on their unique educational goals. The ultimate mission of APAHA is to serve as a “green” regenerating structure that allows teaching to become a focal point of the transmission of knowledge. But the APAHA method of transmitting knowledge is one based around the needs of horses to comprehend clearly this human endeavor we call dressage. APAHA is meant to act as a spark that will help riders and teachers light their own candle of knowledge that will then light the candles of their students. And in this way, we will sustain anew the craft as the cornerstone of the art. Washington, Conn. – A global co-op of equestrians, with its base in Connecticut, has joined forces to fill a vital gap in equestrian education – guiding current and future generations of riders onto the pathway that leads to lightness. The kick-off event for the new educational program, open to all with an interest in how to achieve the tact and finesse that leads to lightness in riding, is scheduled to be held August 30-31, 2015 at Windhorse International in Bethlehem, Connecticut. The event will feature demonstrations of the training techniques that lead to lightness and Dr. Jane Marie Manfredi, of the College of Veterinary Medicine at Michigan State University, will present results from decades of research on equine biomechanics conducted by a team led Dr. Hilary Clayton. The equestrian educational program is the brainchild of internationally-recognized classical trainer Bettina Drummond, who is based in Washington, Connecticut. Lightness is a goal of many riders, regardless of discipline. That so many riders are searching for lightness is evident in the growing number of articles and books aimed at helping them find their way toward this elusive concept. Lightness is hard to define and often misunderstood. It is not, as many riders believe, simply the absence of weight in the reins. True lightness can only be achieved when horse and rider are in a state of harmonious balance. In reality, lightness is one of those concepts that can’t really be explained, it must be felt. However, it can only be felt on horses trained to achieve such balance and with the help of a teacher who can guide riders in how to achieve that balance. Those riders fortunate enough to feel lightness on a horse gain understanding that advances them beyond other riders. Once they feel balance and lightness on a trained horse, riders understand what they must seek to replicate in every ride that they have. This new equestrian educational program is described by its members as a co-op because it is supported by a collection of riders, trainers, breeders and stable owners who are donating their time, their training facilities or their horses. Some supporters donate feed or other supplies to cover care for the school horses. The co-op welcomes the support of anyone who wants to help preserve the art of equitation by educating future generations of riders. Sharon and John Campbell, owners of Just E-Nuf Acres in Palm City, Florida, are also members of the co-op who are not only providing use of their farm for winter educational programs in Florida but also providing use of horses they have bred. 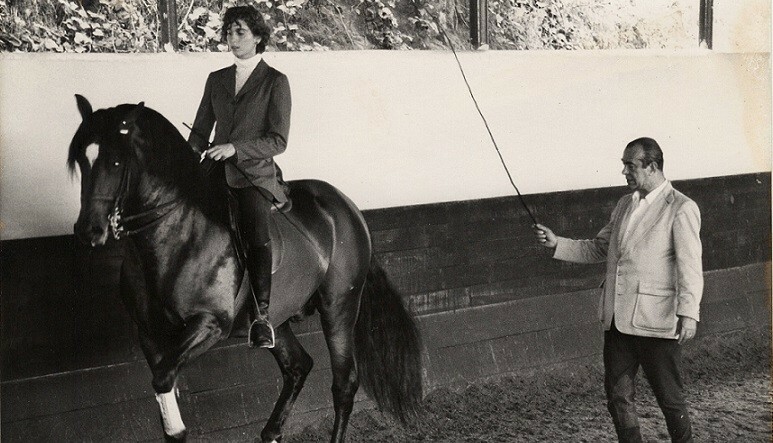 Drummond’s success in mastering the lessons from Oliveira was recognized when she was awarded her license as a trainer by the Nuno Oliveira School of Equitation at the young age of 19. She is still the only American licensed to teach worldwide as a representative of Oliveira’s school. In honor of that achievement, Oliveira gave her the gift of his bridle from the 18th century, which he had received from his teacher Joaquim Gonzales de Miranda – the last Royal Master of the Horse to the King of Portugal. Oliveira’s school was based in Portugal and it is a tradition in Latin cultures for one generation to gift knowledge to the next to ensure that a craft, such as riding, will survive into the next generation. The co-op of equestrians involved in the program wants to uphold that tradition. Drummond’s first experience with lightness herself was as an observer. When she first started training with Oliveira as a child, she did not take her studies with the riding master very seriously. Then one day as she watched his early morning ride there was an instant when he and the horse hit that moment of perfect, united balance just as they were silhouetted by the rising sun. “My head snapped up and in that instant I felt what they had achieved and knew I wanted to achieve that in my riding,” Drummond said. A true partnership with a horse is the moment that the horse recognizes that you are willing to go with him into his world but the horse also recognizes that he must stay with you and not leave you behind. “The horse must explore how far he can go and yet not go without you. This is where use of the seat as an aid comes into play. Your use of the seat tells the horse how far you are comfortable,” Drummond said. Throughout the history of equitation, effective use of the “seat” has been the ultimate goal of riding. For centuries, books on riding have focused on three key “aids” used by riders to communicate with the horse under saddle – hands, legs and seat. Of these, understanding the use of the seat has been the most challenging for riders. However, it is also the most critical of the aids because without effective use of the seat riders often resort to the hands and pull on the mouths of horses in an effort to control them. Only when riders can master correct use of the seat can they let go with their hands and achieve real balance and with it the lightness all riders pursue. The supporters of this new rider educational program are hoping it will attract a growing number of riders and trainers who are seeking to feel what has been missing in their riding and training. The hope is that those who benefit from the program will then apply their new understanding in their training of horses and teaching of other riders. Drummond views the program as something organic that will spread with each generation and in time greatly improve the education of American riders. The demonstrations and educational program scheduled for August 30-31 is the first step in making the public aware of the goals of the program and of what it can do to help riders advance. The concept of the program is that those riders and trainers who benefit from access to the schooled horses must then be willing to donate time to educating others. Hence, the riders participating in the August event are volunteering their time. Drummond said the inaugural educational event has a focus on the double bridle because it is so misunderstood by riders. Huskey can attest to that saying that her experience as a competitor in the sport of dressage is that the “typical competition mindset is to drive the horse into the hand and then using the double bridle to restrict the front end. But this never felt right to me. Bettina showed me a different way.” That other way is to use the double bridle not to contain the energy from the back of the horse but use the control of the double bridle to finesse understanding between horse and rider. “The double bridle is not about the horse sucking back. It’s about creating honesty between horse and rider,” Drummond said. She said the double bridle must work in harmony with the other aids and it is an aid that really should not be used until riders fully understand their horses and can communicate with them through the other aids. “Horses will tell you when it is a moment that all things are possible or if you have reached a point where it is too much for them. You must be able to hear the horse and if it is too much a good trainer then asks, ‘so how can I help you get past this?’ You don’t force the horse, which riders often do with strength and their techniques, such as incorrect use of the double bridle. So it is important for riders to learn these things, like use of the double bridle, with horses that can help them feel when things are possible and when things are not,” Drummond said. Supporters of this new educational program say their goal is to help more riders learn how to bring out the life in a horse and in doing so, to bring out the life in themselves. Only in this way will the art of riding survive into the next generation and beyond. The opportunities of the program are open to any rider with a sincere desire and dedication to learn and those interested should contact Drummond at pruynstud@earthlink.net.